Naga Devatha’s secret visit to Prashanti Nilayam! Nag Panchami is a traditional worship of snakes celebrated on the fifth day of the bright fortnight of the Lunar month of Shravana (July/August) according to the Hindu calendar. “Nag” means serpent and “Panchami” means the fifth day among the fifteen days of the moon’s waning. This festival falls during monsoon and is believed to counter the increased possibility of a snake bite during this time. As per Garuda Purana, offering prayers to snakes on this day, is auspicious and will usher good tidings in one’s life. 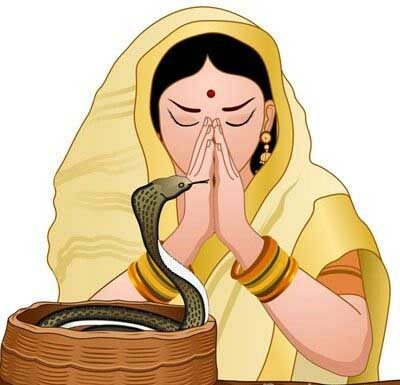 Manasa Devi, the snake Goddess is specially offered prayers on this day. It is said that she manifested from the mind of Lord Shiva. Serpent deities made of silver, stone or wood or painting of snakes on the wall are given bath with water and milk and then worshipped with the reciting of certain mantras. A special feature is an offering of a lotus flower which is placed in a silver bowl. In front of this bowl, a rangoli of snake is made with sandalwood or turmeric paste as the paint. In the villages, pictures of snakes are painted on the walls of the houses and special mantras are written to ward off poisonous snakes. The prayers are also followed by feeding the needy. This festival gives us a profound message. From time immemorial, people have strived to live in harmony with their environment. The essence of Sanathana Dharma is to give importance and respect to all the sentient beings. D.H.Lawrence, in his famous poem “Snake”, brings out the manner in which humans react upon sighting a snake. The first instinct is to hit the snake or kill it as we believe that they are venomous and may pose a threat to our life. We don’t realise that they are just going about their business. Creatures who are living in their natural environment harmlessly, are today, facing too much of human interference as well as habitat destruction. It is our duty to take measures to ensure that the habitat of every creature is protected so that their tribe increases. 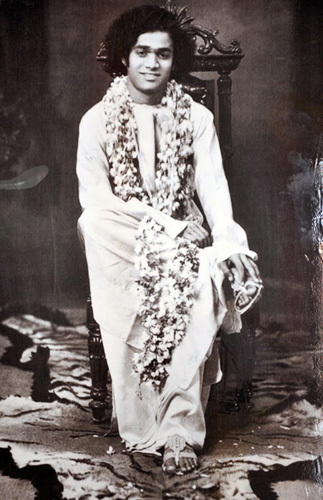 Naga Prathista in Prashanti Nilayam on November 24th, 1955. Following Birthday celebrations on 23.11.1955, Nagaprathista was organized by the devotees under Sri Sheshagiri Rao’s supervision. The platform (present East Gate) was kept ready with the young neem peepul saplings. The Naga idols (ordered from Bangalore) were carried by devotees singing bhajans and were accompanied with a nadhaswaram band. The devotees went three times around Prashanthi Mandir. While the priests were chanting, Swami materialized a Copper plate yantra and placed it into a pit, closing the slab, on which these sacred Naga idols were placed. Devotees could see a radiant Swami who was wearing a big fragrant Flower Garland around his neck which fell upto his lotus feet. The grand function ended with an Arathi to Bhagavan. Swami called Krishnamurthy couples (Sri D.N Krishnamurthi, Smt Lalitha and Sri P.V. Krishnamurthi and Smt Susheelamma) to stand by him for a photograph. Later the photograph was sent to G.K. Vale Studio, Madras (now Chennai) for development. When the prints came out, all were dumbstruck with awe! Instead of a garland around Swami's neck, they saw a Huge Snake, a Cobra with its head spread, looking at Swami with great reverence. When the astonished devotees showed this photograph to Swami, Swami said with a twinkle in his eyes, “Oh! the Naga Devatha was very pleased with your devotion. So he personally graced the occasion. I told him not to be visible to all of you. Else, all of you would have fled in fear, leaving me alone”. The devotees were stunned but it was another reminder to them that Swami was indeed the avathar of Lord Shiva. Once upon a time, there was a farmer who lived in a village with his wife, two sons and a daughter. One day, one of his sons killed three baby snakes while ploughing their land. The mother of the baby snakes was so distraught with grief that she decided to take revenge. She bit the farmer and his entire family that night. All of them died. However the farmer’s daughter was away and hence escaped. The daughter upon returning home, came to know what had transpired and quickly offered a bowl of milk to the mother snake and begged her to forgive her family and to restore them back to life. The mother snake was pleased with the offering and her heart melted. She brought the farmer’s family back to life. The legend says that snakes will never bite any member of the family who observe Nag Panchami! Even today many animals get killed for no fault of theirs. It is our duty to be careful and responsible towards all the animals. Nag Panchami is related to a story from Mahabharatha.Once upon a time, King Parikshit who was the grandson of Arjuna, had been cursed by a sage to die of snake bite. 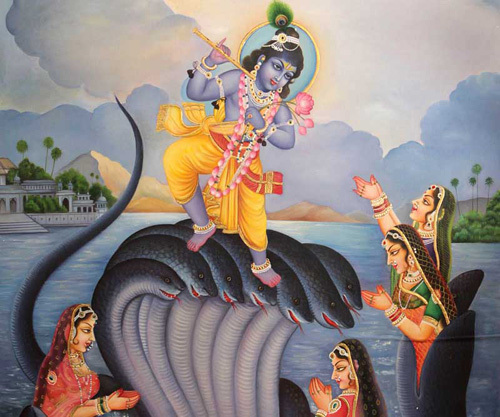 Takshaka, the snake king came to fulfil this curse and killed King Parikshit by biting him while he was meditating on Lord Vishnu. King Janamejeya, the son of King Parikshit was enraged and decided to avenge the death of his father by performing a snake sacrifice known as Sarpa Satra. This yagna would wipe out the entire Naga race. For this great ceremony, a sacrificial fireplace was specially erected. The goal was to kill all the snakes including Taksaka, by dragging them into the fire with the power of the special mantras. Many learned Brahmin sages came to execute this great task!. Janamejeya, himself supervised the ceremony. The yagna was so powerful that it caused snakes from every corner of the world to fall into the Yagna kunda (sacrificial fire pit). It was indeed a horrendous sight! The sages soon came to know that Takshaka had fled and escaped to the nether world of Indra, to seek his protection. Without losing a second, the chief priest invoked a powerful mantra that would bring both Takshaka and Indra into the fire. 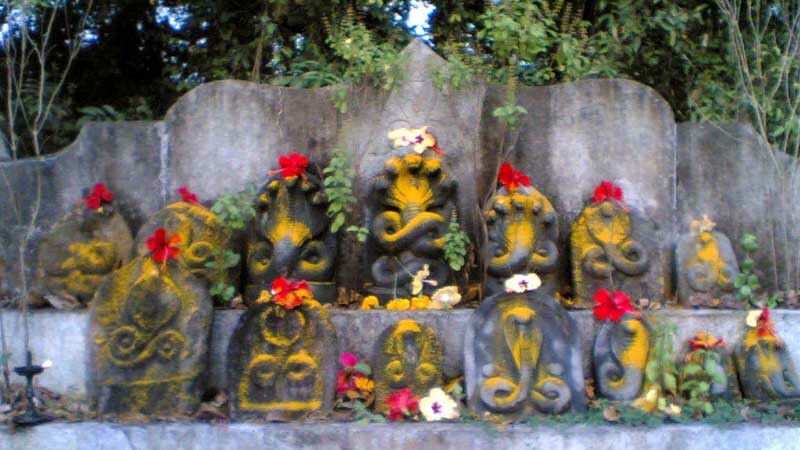 This petrified the Gods who then appealed to Manasa Devi, the Goddess of snakes to intervene and resolve the crisis. She then requested her son Astika to go to the site of the yagna and appeal to Janamejaya to stop the SarpaSatra yagna. Astika impressed Janamejaya with his knowledge of all the Sastras (scriptures). Janamejaya was so pleased that he asked himto seek a boon. It was then Astika requested Janamejeya to stop the SarpaSatra. 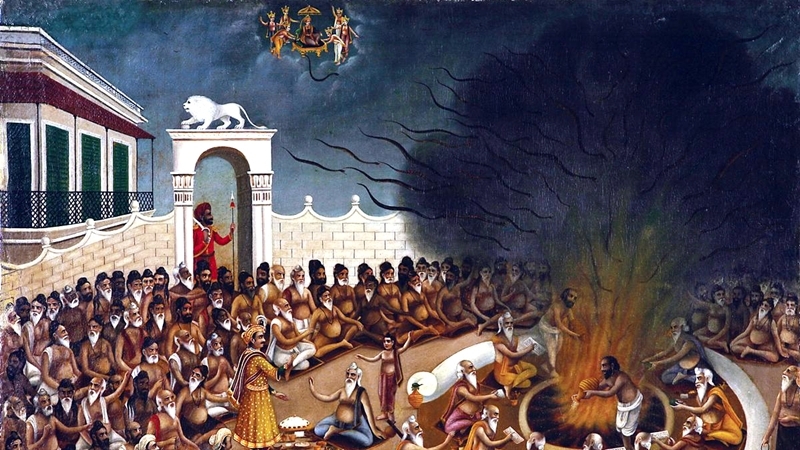 The king Janamejeyawas never known to have refused a boon promised to any Brahmin. So he relented and agreed to stop the yagna in spite of the protests by the sages performing the yagna.Thus the yagna was stopped and the lives of Indra,Takshaka and his other serpent race were spared. Indra himself paid homage to Manasa Devi. This day, according to the Hindu calendar, happened to be Nadivardhini Panchami (fifth day of bright fortnight of the lunar month of Shravana during the monsoon season). Hence this day is known as Nag Panchami. This is a festival of Nagas, as their lives were spared by Astika. From this story, we learn that just like King Janamejeya, we too should fulfil our promise. Naga Panchami is celebrated as the victory of Krishna over Kalinga, the most dangerous snake. One day, when Lord Krishna was barely five years old, he told his cowherd friends that they should take the cattle to a place along the river, Yamuna. Nobody dared to go near this place due to the presence of a terrible serpent Kalinga in the river. Here, the water was blue and boiling hot and bubbling constantly. The steam that arose formed a cloud above the pool which gave off poisonous fumes. In the past, the people who had breathed the fumes, had instantly died. Any birds that flew over the pool got poisoned by the fumes and fell down dead into the bubbling water. However, none of this scared Lord Krishna in the least. When Krishna’s friends came to know about Krishna’s plans, they pleaded with him requesting him not to go to this god forsaken place. Krishna was undeterred and was determined to go along with his cowherd friends and cattle. When Krishna and his friends finally arrived at the spot, Krishna said that he would go into the river for a swim. The boys did their best to stop him, but Krishna was stubborn. Taking off his clothes, he climbed up a tree on the banks of the river and dived into the poisonous water. He did not come to the surface of the water for a very long time. The cowherd boys were consumed with fear. They could not imagine their life without their dear Krishna. Such was their love for him! They called out to Krishna, all the while shedding copious tears of despair. Finally, Krishna appeared on the water’s surface and following him, Kalinga the venomous serpent came out with flames of fire erupting from his eyes and poison spurting from his mouth. Kalinga followed Krishna through the waves and caught him. Meanwhile, the cowherd boys were terrified as they looked on helplessly at this frightening scene. Some of them ran to tell Nanda and Yashoda (Krishna's foster parents) about what was happening. Immediately, Nanda summoned all the milk maids and cowherds as well as every other person in their village to come to Krishna’s aid. Only Krishna’s elder brother Balarama remained calm as he knew that Krishna was a divine incarnation and nothing could ever hurt him. He then spoke to everyone present there and requested them to stay calm. The village folk who had gathered, watched with bated breath with their hearts pounding. 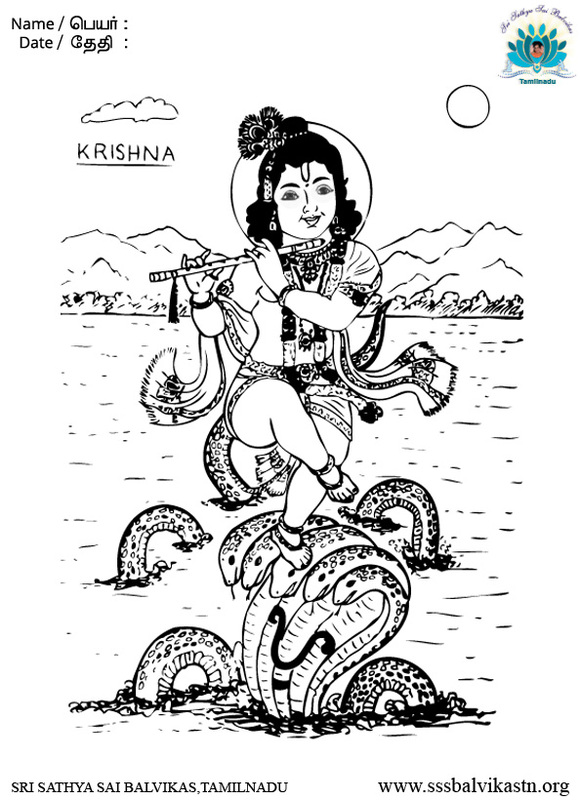 They saw the terrible serpent wrapping its coils around Krishna and mercilessly dragging him into the deep water. They stared in horror at Krishna struggling to come to the surface. They began to pray for his victory over Kalinga. Suddenly, to everyone's astonishment, they saw Krishna growing bigger and bigger in front of their eyes. He was becoming tall and big. To everyone’s glee, the serpent had no choice but to release its coils one by one. At last, the serpent Kalinga was exhausted and gave up the fight. Krishna caught Kalinga by its tail and after whirling it in the air, beat it hard on the water surface. A great effort was needed by Kalinga to keep his many heads above the water. Krishna then did the most unexpected thing! He jumped on top of the serpent's many heads’ and started dancing. It was an unbelievable sight! A sight that will be etched in every ones minds for a very long time. Truly, only Krishna could do such an extraordinary act. The serpent was about to die! The people on the banks of the river started shouting with joy in jubilation. Suddenly, the wives of Kalinga rose to the surface and pleaded with Krishna to save their husband. They said that he had indeed learnt his lesson and his arrogance was shattered. Krishna relented and granted their wish but with a strict instruction that Kalinga should never ever hurt anyone again. He should learn to live in peace with others. He should also promise not to poison the river. 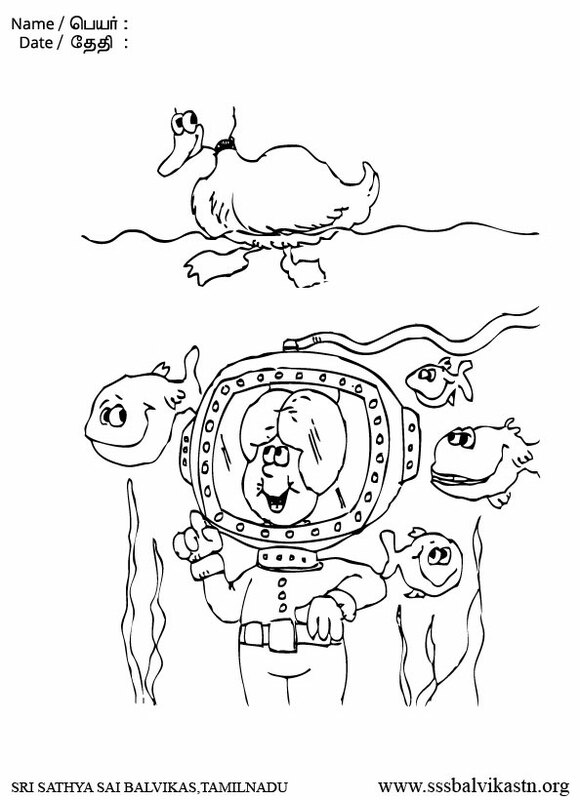 From this lovely tale, we understand that there are many Kalingas polluting the water bodies. Many people do not think twice before throwing garbage like plastics, sewage etc. into the water. We should remember that there are many aquatic animals and plants in the water whose life will be in danger if the water is polluted. Our own life will also be in danger! It is important that we should take measures to keep the water bodies clean. We should also take a pledge not to throw wastes, chemicals, plastics etc. into the water bodies. Being a responsible human being. 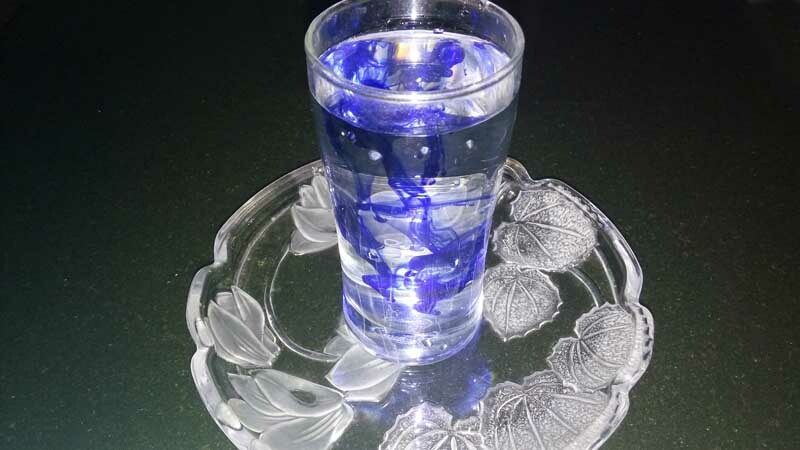 First fill the glass tumbler with drinking water. Ask children if they would drink the water if they feel thirsty. Now, add few drops of ink /paint into the water. Ask children if they would drink the water. The Guru can now start the discussion on the impact of water pollution. Explain that the ink drops are like the chemicals that pollute the water. 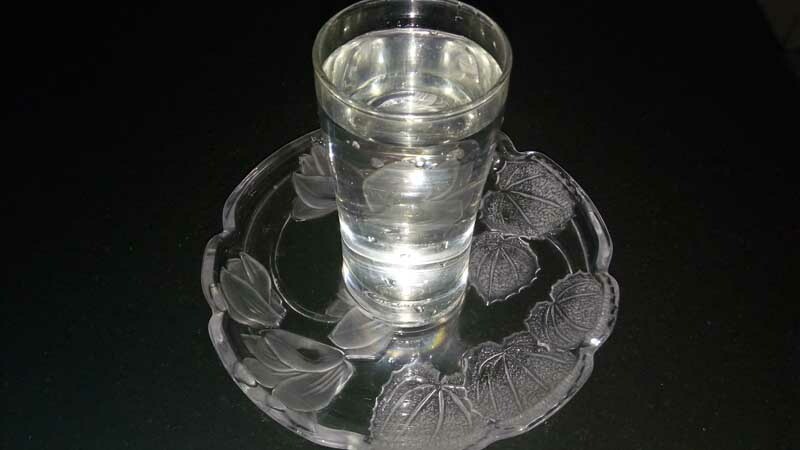 If the water is not suitable for us to drink, will it be suitable for the aquatic animals and plants?